Every driver in the Oconomowoc, WI area needs to have a good auto service center to take their car, truck, or SUV to for maintenance and repair. Even if your car, truck, or SUV doesn't need a new battery or new brakes, getting regular maintenance done by a certified automotive professional is incredibly vital for your vehicles health and performance. Chrysler, Jeep, Ram, and Dodge services like tire rotations and regular oil changes will extend the life of your car and will enhance its performance and efficiency while on the road. Chrysler, Jeep, Dodge, and Ram drivers should only take their vehicles to Ewald's Chrysler, Ram, Jeep, and Dodge Service Center to get reliable and professional maintenance you can enjoy for a long time. Schedule to have your Chrysler, Dodge, Ram, or Jeep serviced today! Ewald's Chrysler, Ram, Dodge, and Jeep service center has all that your vehicle needs to get out on the road again. Going along with proper and regular maintenance are the parts you use in maintaining and repairing your vehicle. You want to make sure that you are using authentic parts for your car. Which is why we only use factory certified Mopar auto parts and Dodge OEM parts, so that they fit your car truck or SUV perfectly. When it comes to Jeep parts and accessories why use anything other than the factory certified OEM Jeep parts? Want your Dodge to stay in top performance condition; do not use the off-brand parts from somewhere else. Head to your local Dodge service department and have them install the latest Dodge OEM parts that will last for many years to come. When it comes to Mopar performance parts, you can count on Ewald Chrysler Jeep Dodge Ram to have just what you are looking for. In the case that we do not have the parts you want or need our team will be happy to order the Mopar parts online for you. We are committed to giving your vehicle the maintenance it needs, and our quality parts and accessories we use reflect that commitment. We make the repairs or maintenance you need for your car understandable and affordable. Our years of training and professional experience will make our service department for all your vehicles needs. 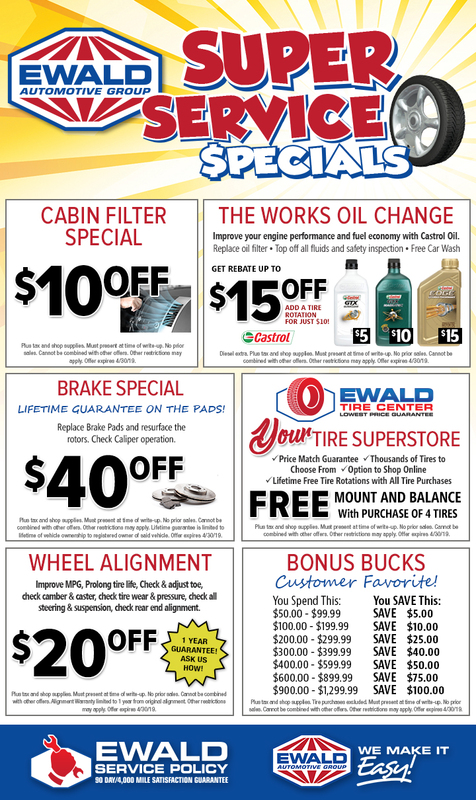 Why Bring Your Vehicle To Ewald CDJR Oconomowoc? Our service department is open 6 days a week. You can contact us directly or fill out our hassle free service form & we will respond shortly after.